The disc brake is a device for slowing or stopping the rotation of a wheel. A brake disc , usually made of cast iron or ceramic, is connected to the wheel or the axle. To stop the wheel, friction material in the form of brake pads (mounted in a device called a brake caliper) is forced mechanically, hydraulically, pneumatically or electromagnetically against both sides of the disc. Friction causes the disc and attached wheel to slow or stop. Modern-style disc brakes first appeared on the low-volume Crosley Hotshot in 1949, although they had to be discontinued in 1950 due to design problems. Chrysler's Imperial division also offered a type of disc brake from 1949 through 1953, though in this instance they were enclosed with dual internal-expanding, full-circle pressure plates. Reliable modern disc brakes were developed in the UK by Dunlop and first appeared in 1953 on the Jaguar C-Type racing car. The Citroën DS of 1955, with powered inboard front disc brakes, and the 1956 Triumph TR3 were the first European production cars to feature modern disc brakes.The next American production cars to be fitted with disc brakes were the 1963 Studebaker Avanti the 1965 Rambler Marlin and the 1965 Chevrolet Corvette Stingray (C2). These brakes offer better stopping performance than comparable drum brakes, including resistance to "brake fade" caused by the overheating of brake components, and are able to recover quickly from immersion (wet brakes are less effective). Unlike a drum brake, the disc brake has no self-servo effect and the braking force is always proportional to the pressure placed on the braking pedal or lever. The design of the disc varies somewhat. Some are simply solid cast iron, but others are hollowed out with fins joining together the disc's two contact surfaces (usually included as part of a casting process). This "ventilated" disc design helps to dissipate the generated heat and is commonly used on the more-heavily-loaded front discs. Many higher performance brakes have holes drilled through them. This is known as cross-drilling and was originally done in the 1960s on racing cars. Brake pads will outgas and under use may create boundary layer of gas between the pad and the disc hurting braking performance. Cross-drilling was created to provide the gas someplace to escape. Although modern brake pads seldom suffer from outgassing problems, water residue may build up after a vehicle passes through a puddle and impede braking performance. For this reason, and for heat dissipation purposes, Cross Drilling is still used on some braking components, but is not favored for racing or other hard use as the holes are a source of stress cracks under severe conditions. On the road, drilled or slotted discs still have a positive effect in wet conditions because the holes or slots prevent a film of water building up between the disc and the pads. Cross drilled discs will eventually crack at the holes due to metal fatigue. Cross-drilled brakes that are manufactured poorly or subjected to high stresses will crack much sooner and more severely. Disc brake discs are commonly manufactured out of a material called grey iron. The SAE maintains a specification for the manufacture of grey iron for various applications. For normal car and light truck applications, the SAE specification is J431 G3000 (superseded to G10). This specification dictates the correct range of hardness, chemical composition, tensile strength, and other properties that are necessary for the intended use. Historically brake discs were manufactured throughout the world with a strong concentration in Europe, and America. During the period from 1989 to 2005, manufacturing of brake discs has migrated predominantly to China. Today, almost 90% of brake discs and brake drums are manufactured in China and exported globally. In racing and very high performance road cars other disc materials have been employed. Reinforced carbon discs and pads inspired by aircraft braking systems were introduced in Formula One by the Brabham team in conjunction with Dunlop in 1976. Carbon-Carbon braking is now used in most top-level motorsport worldwide, reducing unsprung weight, giving better frictional performance and improved structural properties at high temperatures, compared to cast iron. Carbon brakes have occasionally been applied to road cars, by the French Venturi sports car manufacturer in the mid 1990s for example, but need to reach a very high operating temperature before becoming truly effective and so are not well suited to road use. Ceramic discs are used occasionally at the very highest end of the road car market, such as the Porsche 911 Turbo. A similar rationale to carbon is claimed for their use, although prestige probably also plays a large part. In very recent years though, the usage of ceramic brakes on consumer vehicles has increased - mainly due to an increased number of heavy, high-performance passenger vehicles on the road. The first development of the modern ceramic brake was made by British Engineers working in the railway industry for TGV applications in 1988. They were looking for light weight, half the number of brakes per axle, stable friction from very high speeds and all temperatures. They developed the basic carbon fibre re-inforced ceramic process which is now used in various forms for automotive, railway and aircraft brake applications. Warping will often lead to a thickness variation of the disc. If it has runout, a thin spot will develop by the repetitive contact of the pad against the high spot as the disc turns. When the thin section of the disc passes under the pads, the pads move together and the brake pedal will drop slightly. When the thicker section of the disc passes between the pads, the pads will move apart and the brake pedal will raise slightly, this is pedal pulsation. The thickness variation can be felt by the driver when it is approximately 0.007 inch (0.017 cm) or greater. Not all pedal pulsation is due to warped discs. Brake pad material operating outside of its designed temperature range can leave a thicker than normal deposit in one area of the disc surface, creating a "sticky" spot that will grab with every revolution of the disc. Grease or other foreign materials can create a slippery spot on the disc, also creating pulsation. 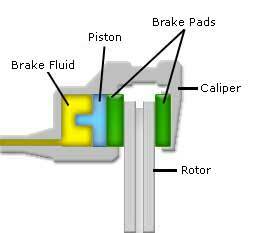 The brake caliper is the assembly which houses the brake pads and pistons. The pistons are usually made of aluminum or chrome-plated iron There are two types of calipers: floating or fixed. A fixed caliper does not move relative to the disc. It uses one or more pairs of pistons to clamp from each side of the disc, and is more complex and expensive than a floating caliper. A floating caliper (also called a "sliding caliper") moves with respect to the disc; a piston on one side of the disc pushes the inner brake pad until it makes contact with the braking surface, then pulls the caliper body with the outer brake pad so pressure is applied to both sides of the disc. The most common caliper design uses a single hydraulically actuated piston within a cylinder, although high performance brakes use as many as twelve. (Some pre-1969 Chrysler and General Motors vehicles had four-piston calipers - usually sought after by restorers.) Modern cars use different hydraulic circuits to actuate the brakes on each set of wheels as a safety measure. The hydraulic design also helps multiply braking force. The number of pistons in a caliper is often referred to as the number of 'pots', so if a vehicle has 'six pot' calipers it means that each caliper houses six pistons. Failure can occur due to failure of the piston to retract - this is usually a consequence of not operating the vehicle during a time that it is stored outdoors in adverse conditions. On high mileage vehicles the piston seals may leak, which must be promptly corrected. The brake pads are designed for high friction with brake pad material embedded in the disc in the process of bedding while wearing evenly. Although it is commonly thought that the pad material contacts the metal of the disc to stop the car, the pads work with a very thin layer of their own material and generate a semi-liquid friction boundary that creates the actual braking force. Of course, depending on the properties of the material, disc wear rates may vary. The properties that determine material wear involve trade-offs between performance and longevity. Early brake pads (and shoes) contained asbestos. When working on an older car's brakes, care must be taken not to inhale any dust present on the caliper (or drum). Some mid-performance brake pads, such as PFC pads(which also have many debond issues), will always squeal during operation, and this does not indicate a problem. When braking force is applied, small amounts of material are gradually ground off the brake pads. This material is known as "brake dust" and usually deposits itself on the braking system and the surrounding wheel. Brake dust can badly damage the finish of most wheels if not washed off. Different brake pad formulations create different amounts of dust, and some formulations are much more damaging than others. This applies to the use of metallic brake pads. Ceramic brake pads contain significantly fewer metal particles in them, and therefore produce less corrosion of surrounding metal parts.